While I’m pretty adaptable and don’t really mind being inconvenienced with the lack of shower etc. for a couple weeks I did make one strong demand: at no time should I be left without a toilet overnight. 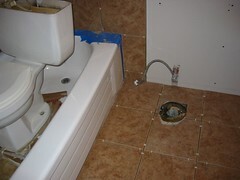 The tile floor and tub surround went in yesterday, and since the tile needed to set overnight, the toilet couldn’t be re-installed until today. For those not in the know: I have one bathroom. That toilet is the toilet. And it spent the night hanging out in the bathtub. b) Take a page from the firefighter’s training manual and use my stash of p-mates to go off the balcony. c) Make acquaintances with the neighbours and run to their apartment to pee before bed and in the morning. d) Run across the street to the Gas Station bathroom. e) Go in the kitchen sink. Which do you think I did?, and which would you have gone for? … And on a related subject, last weekend my somewhat-significant other dragged me to Safeway because I’d been using Kleenex instead of toilet paper for a week, and I only had two tissues left. I didn’t see the rush; I still had table napkins. A combination of b & e 🙂 Those p-mates rule! Erm…. personally, I would’ve insited on a cup or something. for number 1 or 2 . In university, my residence hall room only had a sink in it. The washroom was a communal one down the hall. I didn’t know a single person, male or female, who bothered to use anything other than the sink in the middle of the night. So my vote is E.
At a party once in high school at some run down old house where some people we knew were renting, a friend and I hit the bathroom together – I took the toilet, she couldn’t wait and took the sink. There had been a lot of drinking going on. Only, it was an old house, and the sink was just attached to the wall and wasn’t set in a counter or anything like that. There was a large crack when she sat on it. We vacated the scene before anything bad came of it, but we know that a few days later the landlords were there replacing the sink and apparently had a lot to say about their new renters. The sink wasn’t the only thing that was broken that night, but we weren’t responsible for any of the other stuff. Oops. a couple of weeks? what? are they unionized? I’m thinking… NEIGHBOURS. What better way to get to know those close by, hey? Happy Valentine’s!!! Thanks for the sweet note earlier today. Hope the toilet is fixed now. kitchen sink all the way. also, IANALNDIPOOTV, but I suspect that not having a functional toilet would legallly render your place uninhabitable, and therefore unrentable. I’d go down to the office and demand a refund of that one days rent, dammit!